The Perfect U.S. Economic Storm - Epoch Investment Partners, Inc.
Asset Deflation, Commodity Inflation and the Expiration of the “Greenspan Put”. Goldilocks does not live here anymore. The US economy today is the mirror image of the late 1990’s so-called “Goldilocks economy” which was characterized by low commodity inflation and relatively strong growth. Today, we have high commodity inflation combined with very slow growth. It is the “Bad Wolf” economy. 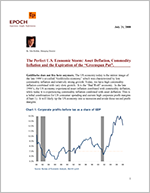 In the late 1990’s, the US economy experienced asset inflation combined with commodity deflation, while today it is experiencing commodity inflation combined with asset deflation. This is a lethal combination for US consumer spending and current high corporate profit margins (Chart 1). It will likely tip the US economy into a recession and erode those record profit margins. US Consumption is unsustainably high. Consumption spiked to more than 70% of GDP from the mid-60% range during the now popped, massive credit and housing bubble during the first half of this decade (Chart 2). The US consumer’s legendary spending prowess has been fueled by record borrowing and declining savings (Charts 3 & 4). Now with US house prices falling at an unprecedented rate, banks tightening credit at a record rate, consumer confidence at a multi-decade low and unemployment climbing, the US consumer is facing hurricane-force headwinds (Charts 5,6,7). Consumption as a percent of GDP is likely to correct to the mid-60% range from 70%+. This 3-4 percentage point decline is roughly 1.5-2.0x the 2 percentage point decline in capital spending as percent of GDP that the US economy experienced after the bursting of the Internet bubble early in this decade (Chart 8). That decline caused a recession. Exports are increasing as a percent of GDP and are a mitigating factor this time (Chart 9). However, it is likely that the admonition “don’t bet against the US consumer” will prove as fallacious as “housing prices don’t fall”. The “Greenspan Put” has expired. Since the Fed’s first rate cuts early last fall, the price of oil has doubled, most major U.S. stock indices have entered into bear markets (down 20% from their highs reached shortly after the first rate cut), banks have continued to sharply curtail lending as their stock prices have plunged amid a continuous stream of losses and capital raisings, and most interest rates are higher while most credit spreads are wider (Chart 10). Ever since the announcement of the Primary Dealer Credit Facility (PDCF) in response to the collapse of Bear Stearns in March of this year, yields have trended higher. Although credit spreads are modestly narrower, they remain wider than they were at the time of the first rate cut. In short, the rate cuts have backfired. They have not helped the financial system. They have contributed to a doubling of oil prices which has acted as a massive tax hike on the US and the world economy and has brought the auto, airline, and trucking industries to their respective knees (Chart 11). Instead of inflating the stock market by cutting rates, the Fed’s actions sharply expanded the commodity bubble which has had deleterious effects on the US economy and financial markets. There is more pain to come in the financial system. To date, we have experienced real estate’s effect on the economy and the financial system. Now we are about to experience the economy’s effect on real estate and the financial system. The first wave washed out the speculators, the unscrupulous and the over-leveraged. As gas and heating oil prices soar and unemployment rises, more prudent consumers are falling behind or defaulting on auto and credit card loans as well as HELOCs (home equity line of credit) and mortgages. The CEO of American Express said recently that credit indicators continue to weaken beyond their expectations. Although it is likely due for a technical bounce, the continuing plunge in the Bank Stock Index (BKX) seems to bear this out. Despite the unprecedented actions of the Fed (front loading an aggressive 325 basis points of rate cuts and instituting the PDCF), the BKX has plunged below its March lows. This is an historic anomaly (Chart 12). In past crises, the Bank Stock Index has never failed to respond to aggressive Fed actions (Chart 13). Hence this price action signals the end of the Greenspan Put. Operation “Barn Door Closing” will likely be a further impediment to a financial system recovery. A predictable outcome of any financial crisis is for regulators, politicians and companies to prohibit practices and policies that contributed to the crisis, to “close the barn door after the horse is out”. For example, Wachovia Corp. recently announced that it would discontinue Option-Arm Mortgages, the key product of Golden West Financial, which Wachovia acquired in a now disastrous $25B acquisition just two years ago at the peak of the housing bubble. Similarly, banks came into this credit crunch with historically low levels of reserves as regulators responding to the accounting scandals of the Internet bubble forced the banks to do away with “cookie jar” reserves and the asset appreciation of the recent housing and credit bubble artificially suppressed credit problems. Now regulators are pushing banks to increase reserves as delinquencies accelerate. Reserves to loans peaked at 2.50% during the commercial real estate bust in the early 1990’s. They are a little over 1.50% today (chart 14). The Financial Accounting Standards Board (FASB) is also proposing securitization accounting changes (FAS 140) that will force consolidation of special purpose entities, conduits and SIVs. This will force banks to raise more capital or sell-off more assets. For example, if the rule were in effect at the end of the first quarter, Citibank would have had to consolidate $1 trillion of additional assets! Finally, the elimination of “pooling of interest” accounting makes it much more difficult for good banks to acquire bad banks. Purchase accounting forces the write-down of the bad bank’s assets. This reduces tangible equity and capital ratios and may require the acquirer to raise more capital. High developing country inflation threatens the world currency regime. Particularly since the Asian Financial Crisis of the late-1990’s, many countries throughout Asia and the Middle East fixed their currencies to the dollar and followed Mercantilist economic policies in order to build-up foreign exchange reserves to prevent a repeat of the catastrophic devaluations and defaults that wracked the region. These reserves were channeled back into the US as shown by the substantial increase in foreign official holdings of US Government securities (chart 15). However, the recent US Federal Reserve rate cuts since the bursting of the housing/credit bubble threaten to undermine this so-called “Bretton Woods-2” monetary regime. Asian and Middle Eastern countries have continued to print their currencies to maintain their peg to the dollar even though their economies are booming (Chart 16). Negative real interest rates combined with strong growth have ignited high-to-virulent inflation throughout the developing world (Chart 17). It seems as though these countries have no choice, but to loosen or break their dollar pegs in order to prevent destabilizing inflation. This could potentially end the ultra-low interest rates the US has enjoyed over the past decade. What will break oil’s rise? It is likely that a significant and sustained global economic slowdown will be necessary to break the price of oil as supply constraints have resulted in a muted response to the rapid run-up in prices and developing country subsidies have prevented the rationing of demand. Despite declining OECD demand, spare capacity is a still tight 2-3 million barrels per day in an 85mm barrel per day market. The significant decline in many emerging stock markets this year may be forecasting such an economic slowdown (Chart 18). A sizeable decline in the price of oil would act as a tax cut and help stabilize the US and world economies, but it may only come at the cost of significantly slower world growth, which would undermine US export growth. While the US seems to have skirted an official recession for the time being, due in part to the one-time boost from the recent income tax rebates, it faces extraordinary challenges. These include a doubling of oil prices, a broken financial system still reeling from a credit and housing bust, and an over-leveraged, savings-short consumer that has no choice but to cut-back spending. It is quite possible that the worst is still to come as the lagged impact of higher oil prices and the absence of tax rebates could make this winter particularly difficult. The traditional monetary response of cutting rates has backfired by contributing to the run-up in oil prices. Financial services and consumer discretionary stocks should continue to under-perform. Companies with strong balance sheets, non-cyclical businesses and strong free cash flows that can fund dividends and/or share repurchases should do relatively well.